Who: Shining Hope Farms, a local nonprofit therapeutic horseback riding program that serves children and adults with disabilities throughout the Western Piedmont Region. Our mission is to enable children and adults with disabilities to achieve functional goals through the use of equine assisted activities and Hippotherapy. 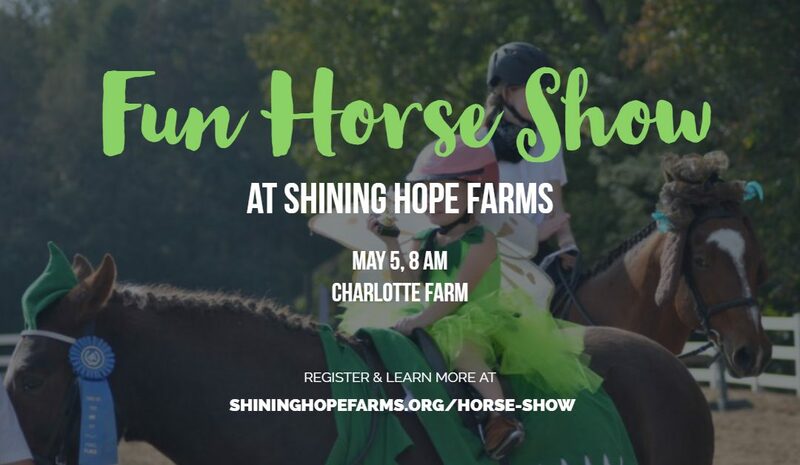 What: Shining Hope Farms is hosting a Fun Horse Show on May 5 with individuals from surrounding counties. This event will be a great way for riders with disabilities as well as those who are able bodied to show off their hard work and skills to family and friends, socialize, and have fun! Photo and/or video opportunities will be available of the show as well as interview with the parent of a participant and a Shining Hope Farms staff member. There will be Dressage and Combined tests starting at 8 AM and a Hunter/Jumper Division starting at 11 AM. The day will conclude with a games portion including an egg and spoon race, musical cones, ride-a-buck, and a costume class. Lunch consisting of burgers, hot dogs, chips, and slaw will be available to purchase with cash. Generous sponsorship help from the following businesses have made this event possible: Platinum Sponsors: First National Bank, Mountain Island Family and Cosmetic Dentistry, W. Kevin Monroe DDS, PA and Courtney S. Deskus DDS, The Worrell Network Office, Northwestern Mutual, and Star Bright Pharmacy. Gold Sponsors: Atrium Health, and Horne Heating & Air Conditioning. Silver Sponsors: AcuCare Clinic, Clear Water Concepts, and Stanton Enterprise Inc. Bronze Sponsors: ASAP Graphix & Signs, Inc., Bluhawk Wealth Management, Couldwood Tire & Auto, Helen Adams Realty (Angie Godley Bright and Judy Godley), Mountain Island Plumbing, and Sports Page Food & Spirits. Food & beverages provided by: Cooks Presbyterian Men of the Church. To attend, please enter at the parking lot with the Shining Hope Farms sign at the end of Kidd Lane. Feel free to park anywhere. The media contact, Jean Penner will be stationed at the check-in desk at the front of the barn (visible from the parking lot).